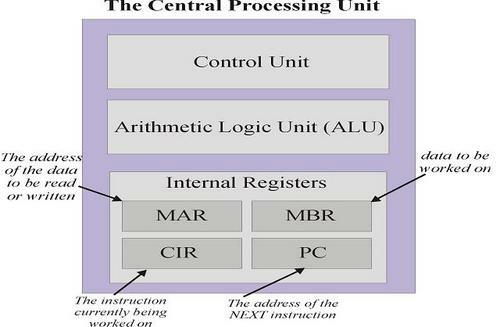 The CPU contains an Arithmetic logic unit (ALU for short) and this performs arithmatic and logic operations. The inputs to the ALU are the data to be operated on (called operands) and a code from the control unit indicating which operation to perform. Its output is the result of the computation. The Program Counter holds the address of the next instruction to be loaded, this is called an ‘instruction pointer’ (IP) in Intel documentation. This will normally be incremented during each cycle, i.e. it will point to the next instruction in memory, However, an instruction can tell the program counter to point to a different instruction next. E.g. if the current instruction is in memory location 2123, then ‘Goto 2565’ will tell the program counter to point to 2565 next and not 2124. Hence, once the GOTO 2565 is executed, the current contents of the Program Counter are over written by 2565. The CPU has to share data and transfer data to other parts of the computer at some point, it does this via the use of a Data Bus. 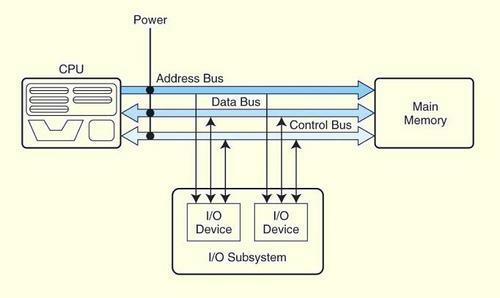 Busses consist of Data lines, control lines and address lines. While the data lines convey bits from one device to another, control lines determine the direction of data flow, and when each device can access the bus. Address lines determine the location of the source or destination of the data. Every computer contains at least one clock that synchronizes the activities of its components. The clock frequency, measured in megahertz or gigahertz, determines the speed with which all operations are carried out. A computer communicates with the outside world through its input/output (I/O) subsystem. I/O devices connect to the CPU through various interfaces. The normal execution of a program is altered when an event of higher-priority occurs. The CPU is alerted to such an event through an interrupt. Interrupts can be triggered by I/O requests, arithmetic errors (such as division by zero), or when an invalid instruction is encountered. Each interrupt is associated with a procedure that directs the actions of the CPU when an interrupt occurs. ASM (Assembler) is the lowest form of human-readable instructions for a processor to carry out. ASM is converted into Opcodes by the computer before arriving at the cpu for processing in the fetch-execute life-cycle. Instructions have three parameters: function, reference one, reference two. The only required parameter is the function as some do not require additional parameters. Instructions come in the following format: | Opcode | Address 1 | Address 2 |. The opcode is the part which asks, "What shall i do with the 2 addresses?" for example, you may wish to Add the 2 addresses together or multiply them, this is what the opcode is and is stored in the first section of the instruction format. This opcode is deciphered and then compared against a library of instructions held in the Control Unit. The Address part points to the part of the memory in which the data relating to the instruction is being held. Memory locations are stored in sequential order and can hold data or instructions. CBA TO CARRY ON.